…but I didn’t have to wait in it. Why, you ask? Three words: State Farm, baby! 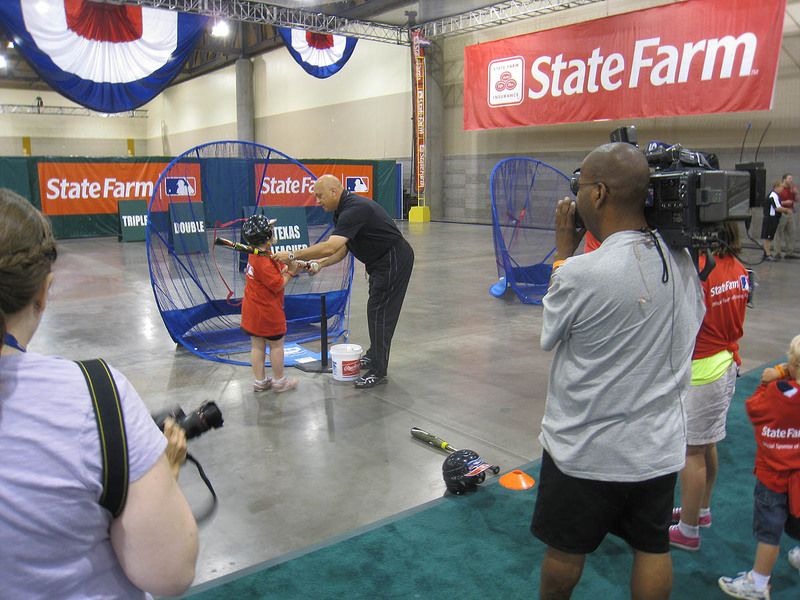 As I mentioned in my previous blog entry, State Farm hooked me up with an all-expenses paid trip to the Home Run Derby, and better yet, they set up an opportunity for me to meet Cal Ripken Jr., my all-time favorite baseball player and childhood hero. 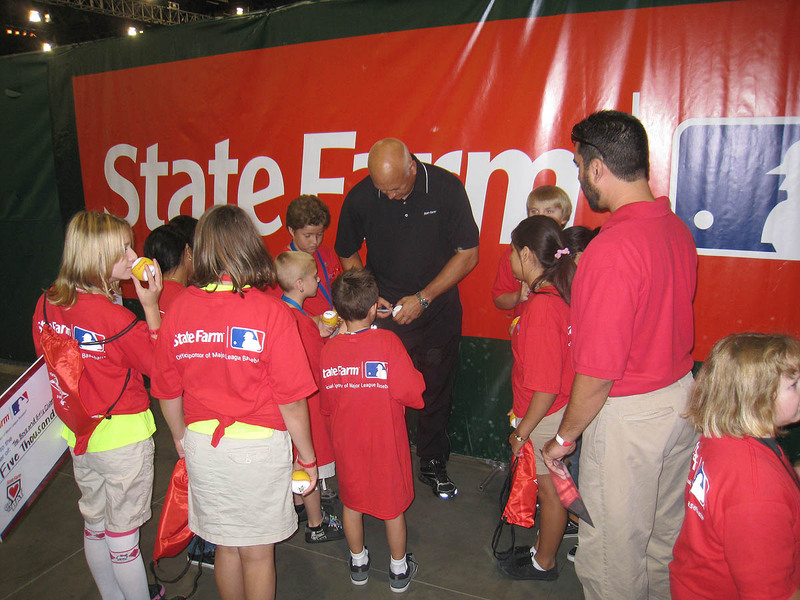 Ripken was going to be at FanFest, leading a youth baseball clinic with a local branch of the Boys & Girls Clubs of America. This event was not open to the public, but because it was sponsored by State Farm, I was one of the lucky few who got to participate. There was lots of media. There were State Farm reps. There were FanFest employees. And there were a couple dozen other folks who got to be there for one reason or another. 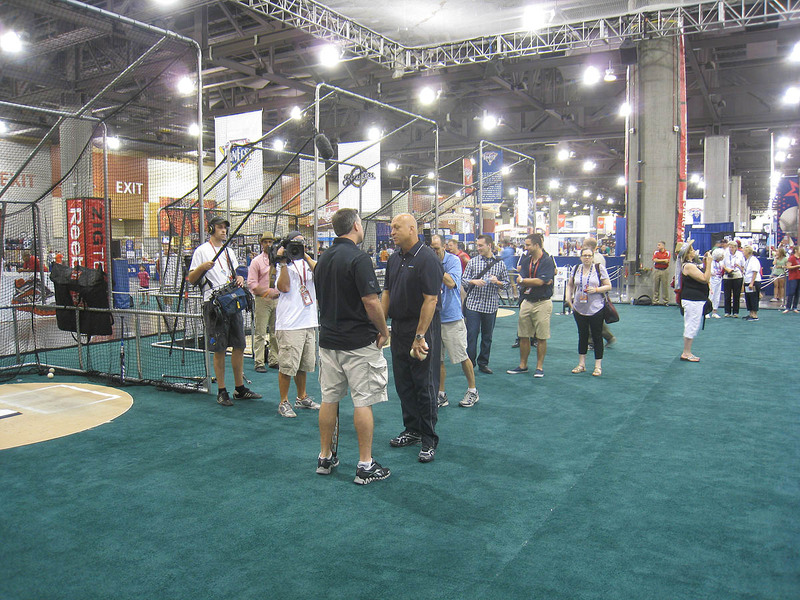 The place was buzzing, and when Ripken arrived some time around 9:30am, it was simply amazing. The older I get, the less-star struck I get, but when I first saw him — when I realized that I was actually breathing the same air as him — my heart started racing. 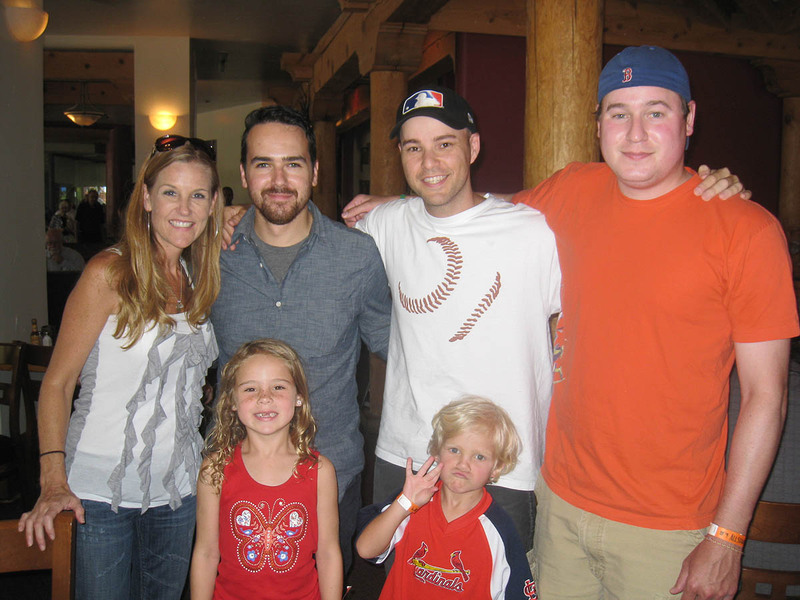 I’d gotten his autograph a few times at baseball games over the years, and I briefly met him and his brother Billy at a book signing in New York City in 2004, but this was the first time that I was going to get to hang out with him and actually TALK to him like a real person. 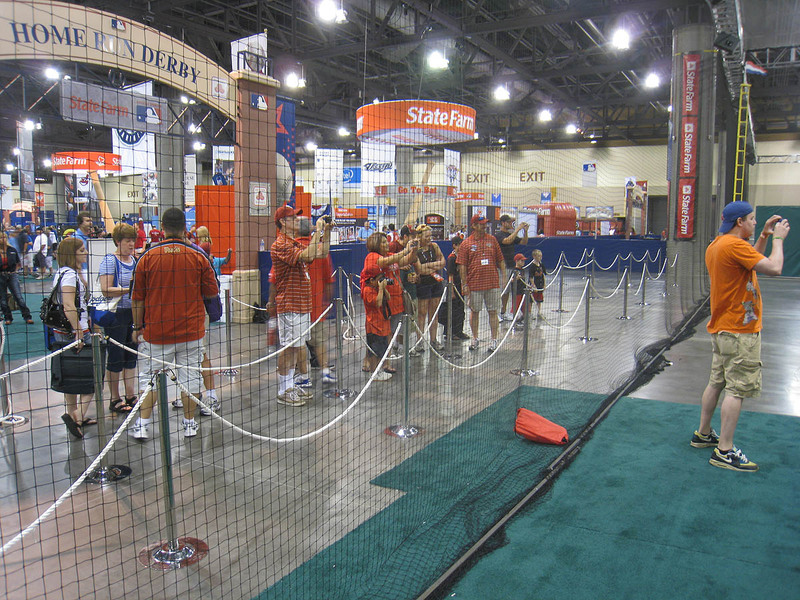 Moore was at FanFest to help raise awareness for State Farm’s Go To Bat program — a virtual Home Run Derby that fans can play online to raise money for many different charities. 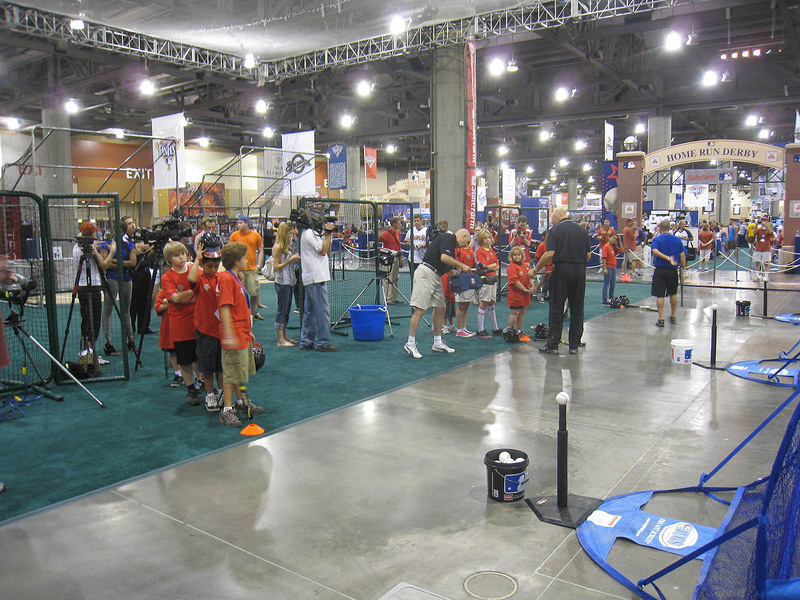 One of those charities is Pitch In For Baseball, a non-profit organization that provides baseball and softball equipment to underprivileged kids all over the world; I’ve been fundraising for Pitch In For Baseball since 2009, so this whole State Farm experience was special on a number of levels. I could have met Moore and gotten a chance to talk to her if I’d been willing to wake up when it was still dark outside. 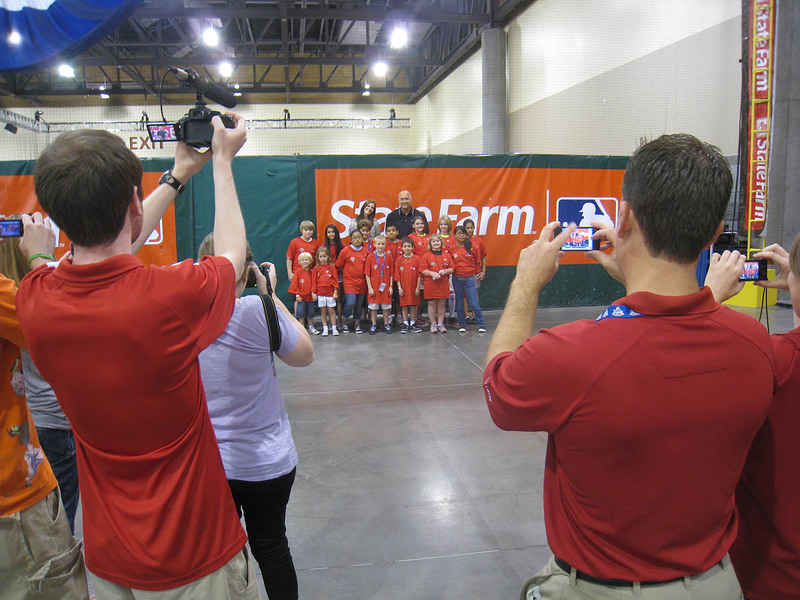 Much earlier in the morning, she was available to the media and to the folks connected to State Farm, but I just couldn’t bring myself to sacrifice THAT much sleep. No offense to her. I think she’s lovely. 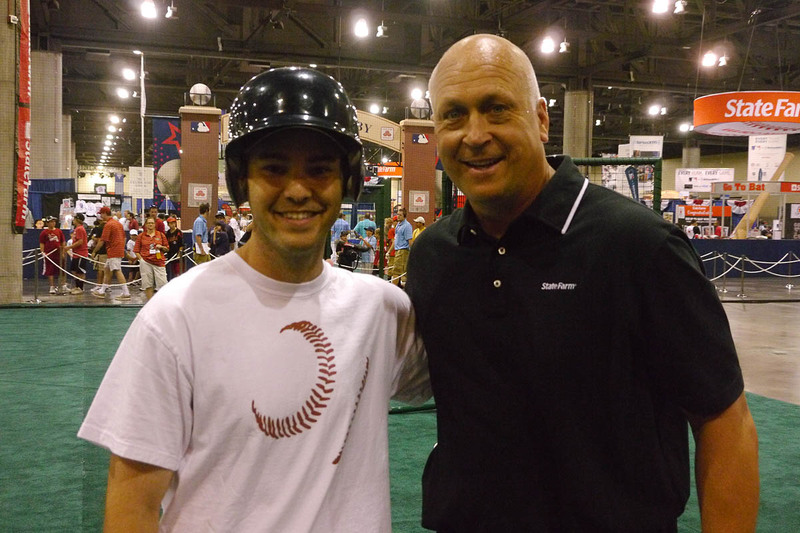 But all I could think about was meeting Ripken and being as well-rested as possible. Unfortunately, that’s the only photo of him that I got, so you’ll have to take my word that it was Sean Casey. 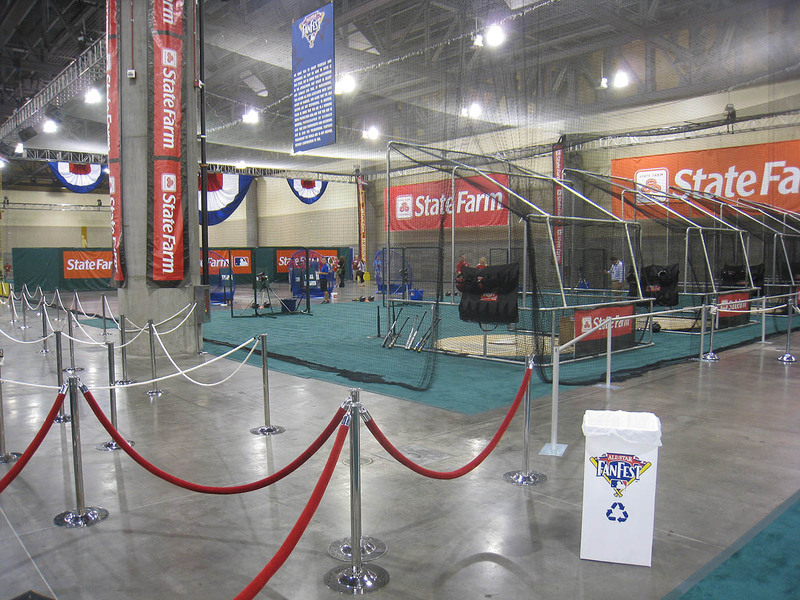 The two men squared off in a pitcher/batter battle of sorts; Ripken fed a bunch of balls into one of the pitching machines, and Casey flat-out RAKED. For a guy who’s 37 years old and hasn’t played in the Major Leagues since 2008, his bat speed was still shockingly quick, and his mechanics were a thing of beauty. I moved behind the cage for a closer look and stared in awe. It’s like I was watching a different species. Human beings don’t move like that or get balls to explode off baseball bats like that. 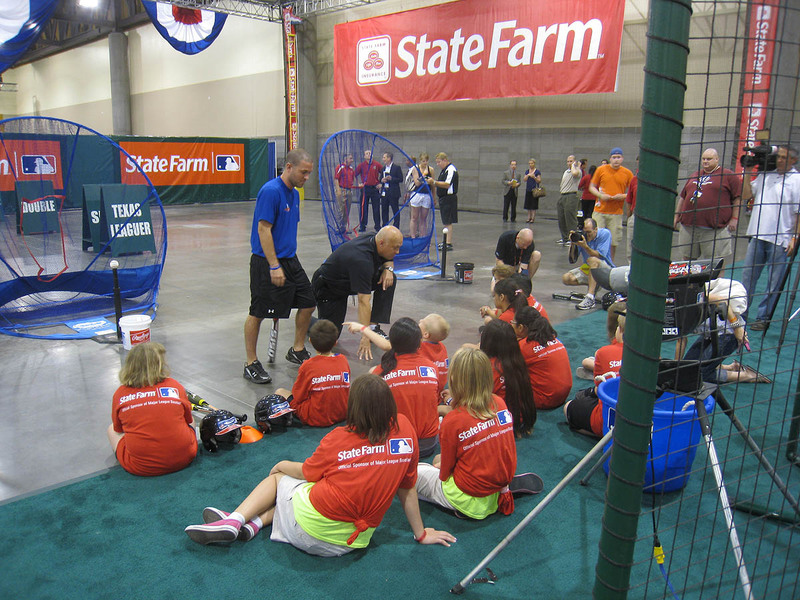 As you can see, Ripken was pitching the balls to me nice and slow, so they were really easy to hit. The only challenges were (a) making sure to pull the balls so I wouldn’t drill him with a come-backer and (b) not re-injuring my still-weak left ankle. Every time I swung, I had to step and land and plant on my left foot, and let’s just say that it didn’t exactly feel great. Normally, when I swing at a pitch, I keep my front side closed, but in this case I was forced to fly open early so that when my foot hit the ground, my toes would be pointing toward Ripken. By stepping like that, I was much less likely to roll my ankle over, as I did on 6/3/11 at Citi Field. The point is, don’t judge my hitting skills solely on that video. I’ll be the first to admit that my swing looks rather crude. I don’t know how many swings I took — 30 or 40, at least — but as I tweeted the following day, I took enough to make myself completely sore. I’m not complaining, just reporting. I probably could’ve gotten him to sign, but I didn’t ask. I was trying not to go totally FanBoy on him, and anyway, I really just wanted to talk. That had been a lifelong dream — to simply have a conversation with Cal Ripken Jr. — and I didn’t want to taint it by asking for anything. …and we waited for Ripken to finish talking to the media. 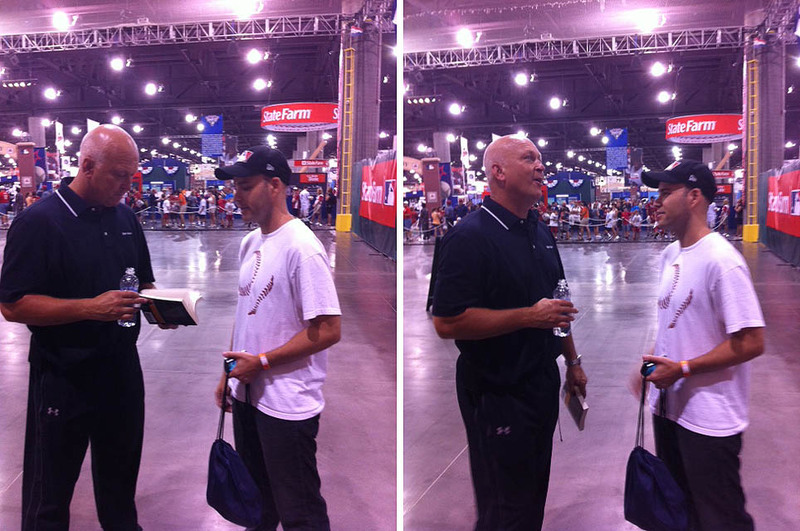 In the photos above, Ripken is holding a copy of my newest book, The Baseball. I had brought a copy to give to him, and he looked it over for a bit. I responded by telling him about the three foul balls that I’d caught on 5/12/11 at Camden Yards, and he asked me where I had positioned myself in the stands. 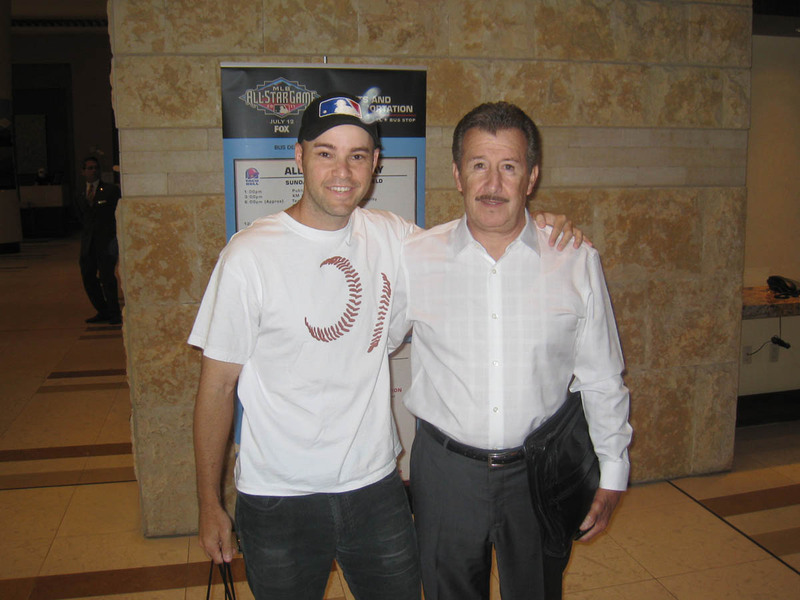 Kindly disregard the weirdly-shaped orb floating next to my baseball cap; all that matters is that I’m standing next to Angels owner Arte Moreno. It was 1:00pm local time. 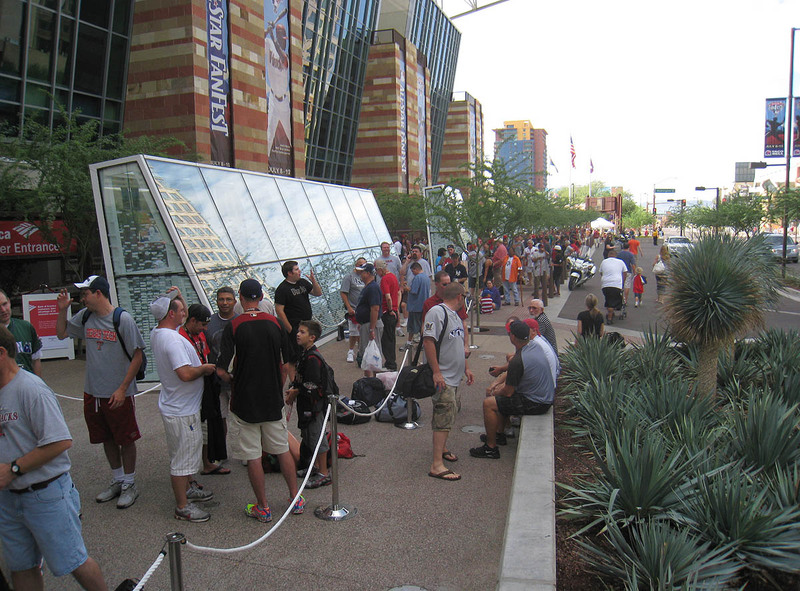 The Home Run Derby wasn’t scheduled to begin for four more hours, but Chase Field was set to open at 2pm. I hurried up to my room, gathered all the stuff that I was going to need for the day, and changed into my yellow Homer Simpson t-shirt. 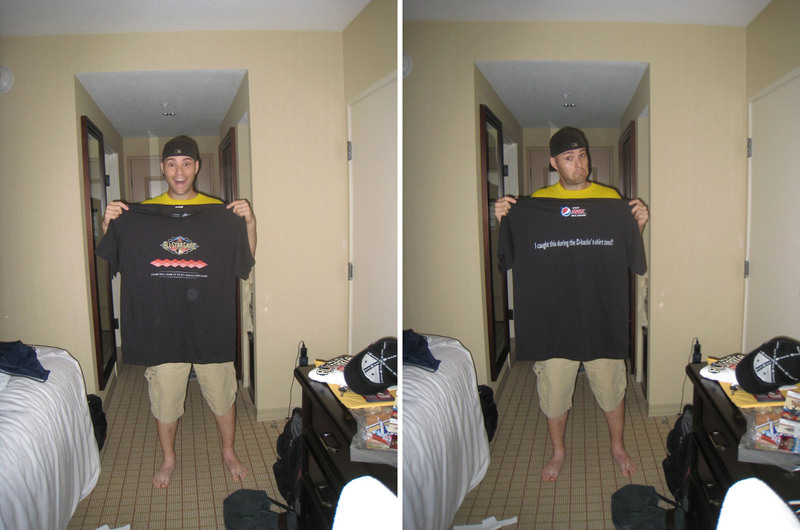 I had time to do this because Ben was holding a spot for me at the front of the line outside the left field gate. 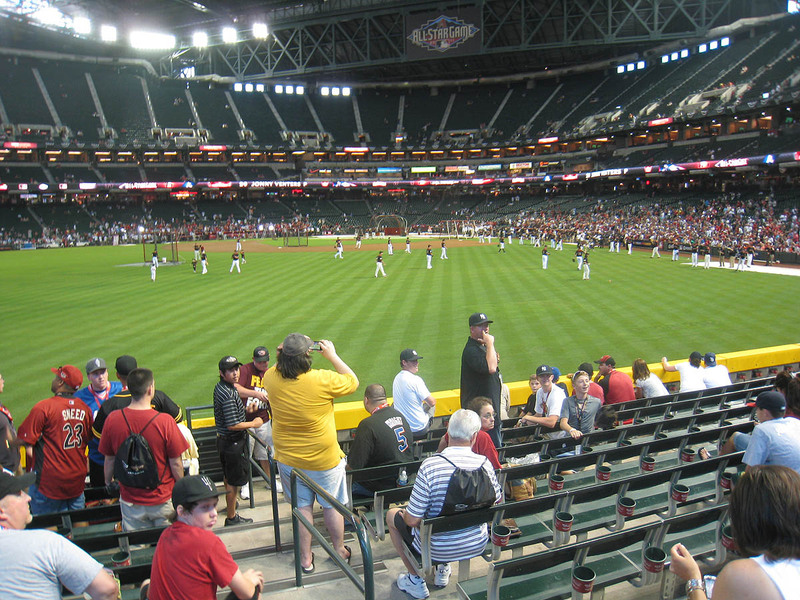 As you can see, fans were scattered throughout the bleachers because they weren’t allowed to go down toward the front. I knew that the whole section was going to be packed. I knew that it was going to be almost impossible to catch home runs. My whole strategy was based on being in the very front row and calling out to the players for toss-ups, so when I realized that I wasn’t going to be able to do that, I got really nervous about getting shut out. My day was officially complete, or at least that’s how I felt. My modest goal had been to snag *one* ball with a Home Run Derby logo, so at this point, anything else was going to be a bonus. The guard had his eye on me after that, so I shifted over to the far end of the section. That didn’t seem to bother him, and then when he wasn’t looking, I quickly moved a few rows closer to the field. 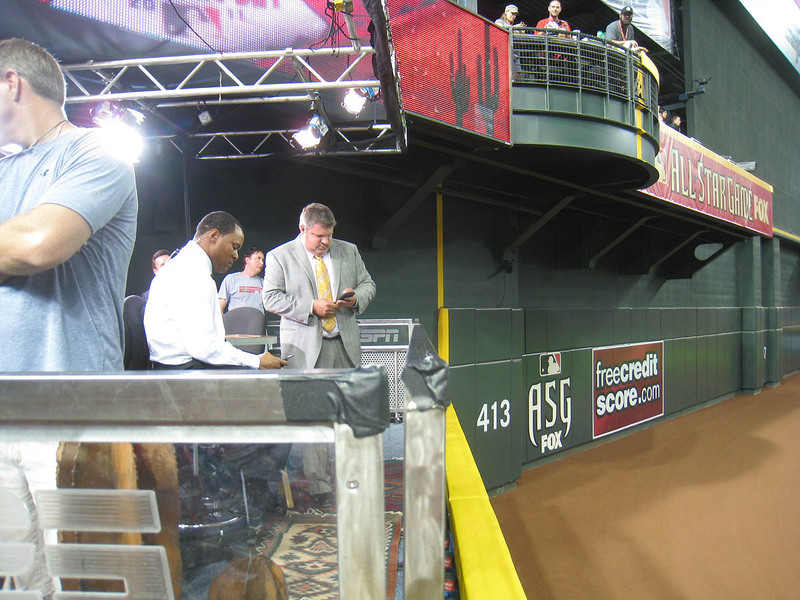 Soon after I got there, Joel Hanrahan fielded a ball near me and tossed it in my direction. I was standing on a bench at that point (as were many other people), and although the ball fell a bit short, I was able to reach forward and catch it over several other outstretched hands. Meanwhile, the folks in the front were still getting most of the action. 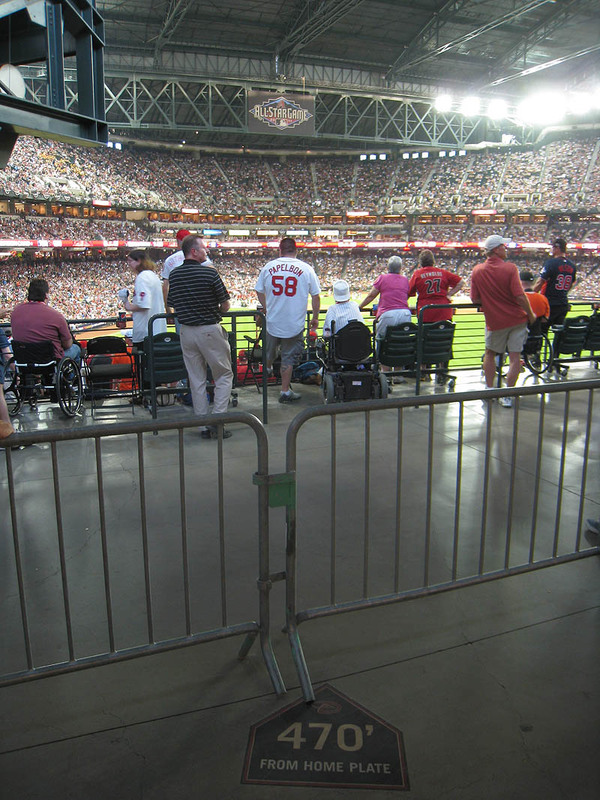 I simply had to get down there, so after the National League finished hitting, I walked down to the front, and before I got yelled at, I offered to pay one of the fans there for his spot. “Are you serious? !” I asked in disbelief. As it turned out, I enjoyed myself a whole lot. Two minutes after the American League started hitting, I got Chris Perez to toss me my 3rd ball of the day, and soon after that, I caught a home run on the fly. I’m not sure who hit it, but I think it was Miguel Cabrera. “Do you want your spot back?” I asked the guy. “Nah, we’re fine back here,” he said from the row behind me. Do you recognize the guys looking down at their mobile devices? Barry Larkin is wearing the white shirt and John Kruk is sporting the suit. Halfway through the American League’s portion of BP, I got Aaron Crow to throw me my 5th ball of the day, and toward the very end, I got another from David Robertson. 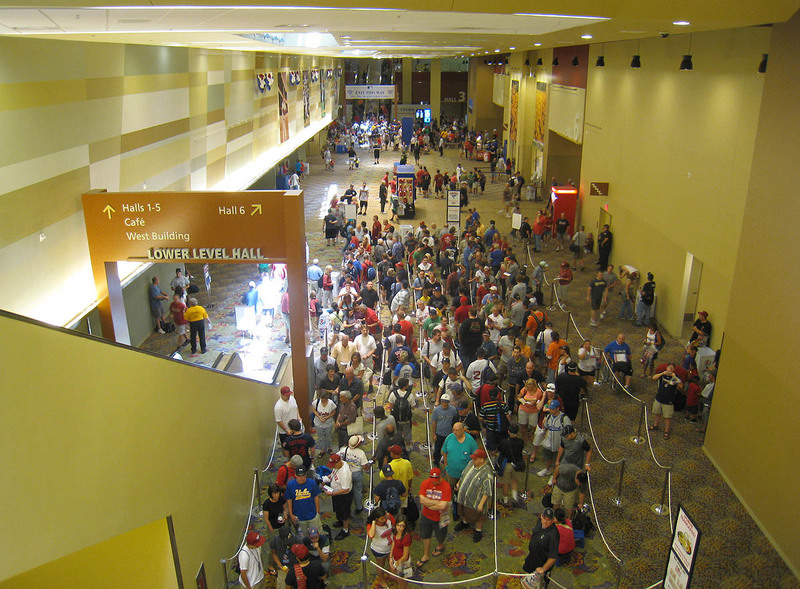 In the photo above, did you notice my new BFF Cal Ripken Jr. on the TV screen? He had just thrown the ceremonial first pitch. That is one snazzy baseball, complete with REAL gold. It kinda looks like a Christmas tree ornament, no? Four hundred seventy feet? That’s not out of the question, right? Well, what I didn’t realize at first was that the “470” sign didn’t factor in the elevation above the field — so really, it would’ve taken a 500-foot home run to reach me. And then some. Even though it felt like I was a mile from home plate, I knew that I *was* at least within potential home run range. More importantly, though, if a ball did end up flying my way, *I* was going to have some range. 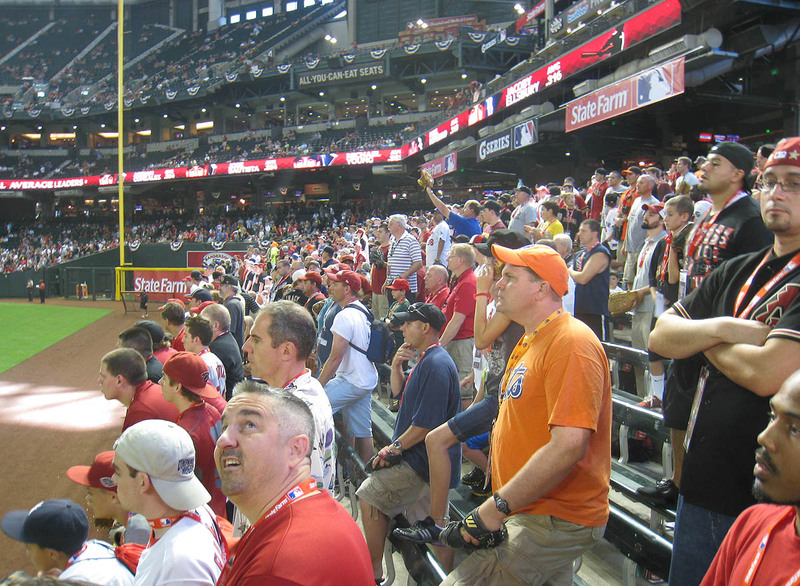 During Prince Fielder’s turn at bat, I noticed something bizarre as one of his home runs sailed into the crowd. It vaguely appeared that a fan had lost his balance and was dangling over the concourse railing up above. Given the fact that this incident took place on the same day as the memorial service for Shannon Stone, the media was on high-alert and made a big deal of it — but I’m not so sure they should’ve. I heard lots of speculation that the near-fall was staged, and although I obviously can’t confirm that theory, I can tell you from having witnessed the incident from 30 feet away that it’s definitely possible. For starters, the fan who nearly fell wasn’t even close to the ball, so there’s no reason for him to have been reaching for it. More importantly, it didn’t even look like he was ever in any danger. 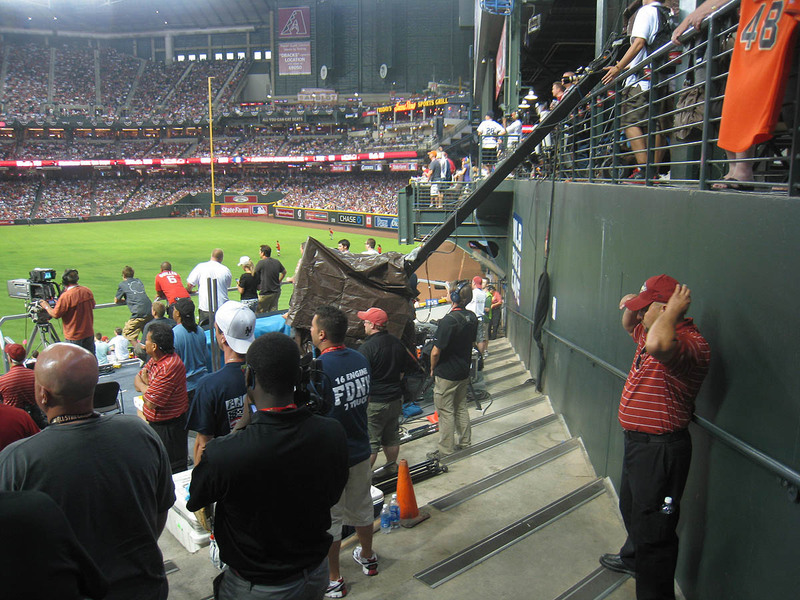 It appeared that once he was partially over the railing, he made no effort to get back into the stands. I remember thinking, “What the hell is going on?” because it almost looked like the guy was lingering on the railing and climbing out over it on purpose. I seriously thought it was a joke at first, so I was shocked to see all the articles about “the tragedy that was narrowly avoided.” I want to make it clear that I don’t take this lightly. There’s nothing funny about falling (or almost falling) over a railing. I don’t want to piss people off by claiming that something wasn’t a big deal when it really was. I’m just speculating here and telling you what I saw, and although I could be wrong, I think that the media (and baseball world) got trolled. As many of you already know (and commented about on my previous entry), I caught Robinson Cano’s 7th home run during the final round, and if I heard correctly, it was the 4th longest home run of the entire Derby. Estimated distance: 466 feet. There really wasn’t anything fancy about it. I had a little room to maneuver on the staircase, but it was pretty much hit right to me. If it had traveled one or two feet shorter, the fans in front of me probably would’ve been able to reach up and catch it. If it had traveled five feet farther, I would’ve been able to back up against the wall and make a leaping catch. (But not too much of a leaping catch because my left foot still isn’t feeling right.) Was I lucky? Yeah, no doubt, but in a way, I was also unlucky. It was a great spot, and if things had gone just a little bit differently, I easily could have caught two or three more. In the screen shot above, do you see the fan directly above me, behind the railing? As soon as I caught the ball, that guy asked me if he could take a picture with it. …and I told him I’d email it to him. Normally, I do NOT give away commemorative balls, nor do I give balls to grown-ups, nor do I give balls to fans without gloves, but this seemed like a good time to break my own rules. “Did you get a ball today?” I asked him. “Nah, I didn’t get anything,” he replied. 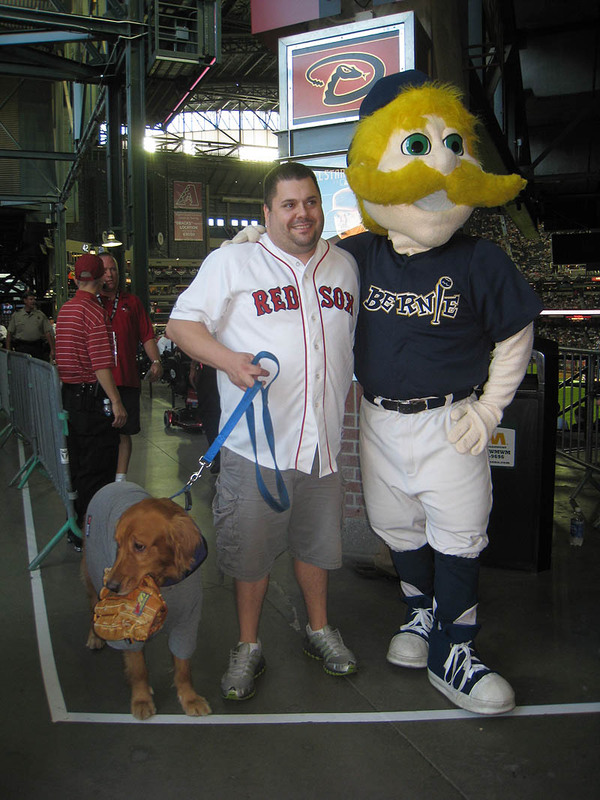 I wasn’t going to hand him the actual home run ball from the Derby itself, but that didn’t seem to matter to him. He was thrilled just to have ANY ball, and it made me really happy to give it to him. 1) Greg Barasch, a fellow ballhawk from New York City. 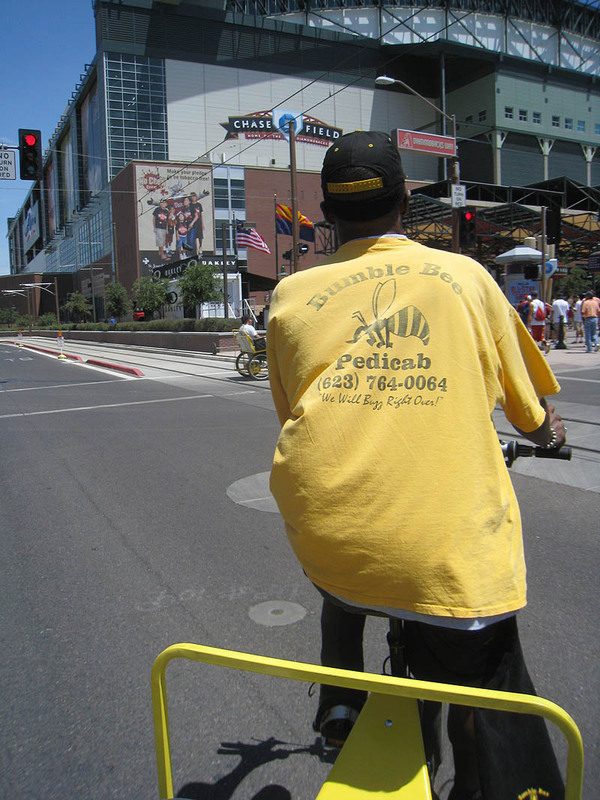 2) Tony Dobson, a Chase Field regular. 5) Ben Weil, holding some of the hats he brought on this trip. 6) Tim Scott, the nephew of the woman on the right. 7) Kelly McMahon, a former Watch With Zack client and current friend. • 537 balls in 66 games this season = 8.14 balls per game. Thank you all for the Twitter love and blog comments and emails. I know I’ve been lame about replying lately, but that’s only because it has taken a FULL-time effort to keep up with the blog. 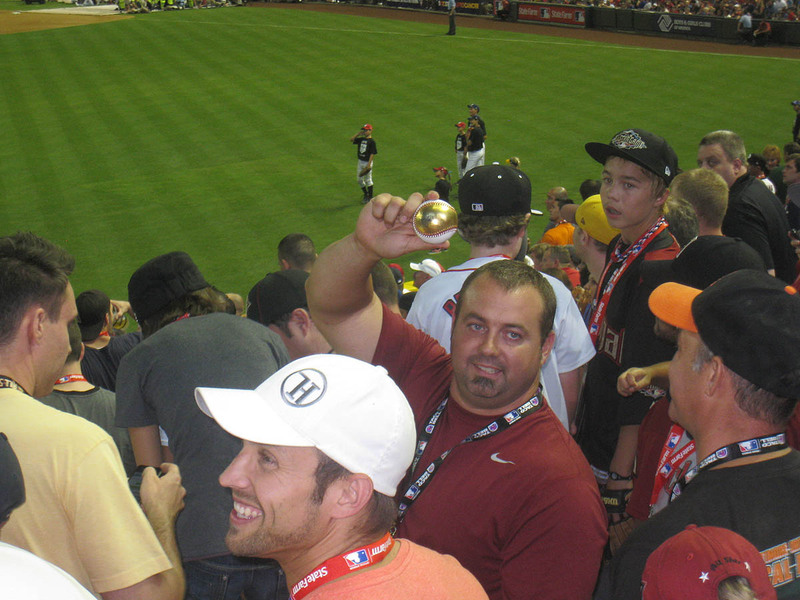 I still need to write about my (truly insanely incredible) experience at the All-Star Game, and yes, @oriolefan123, I’m going to be at Camden Yards today (July 14th) and tomorrow. 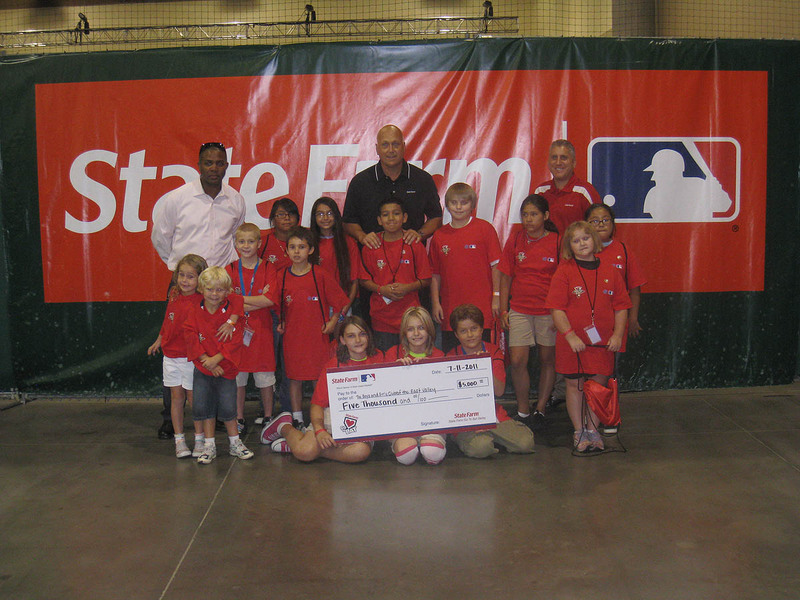 I was invited to the State Farm® Home Run Derby and Go to Bat kick-off programs by State Farm. All my travel, food, and lodging expenses were taken care of by State Farm. I was not paid to write this post. Looked like a madhouse there. Cool that you got to meet Ripken. But what’s even cooler is that you got a HR Derby ball. Too bad it wasn’t gold because they sell for like $150 – $200 dollars because it’s real gold. That was awesome you met one of the greatest shortstops ever. Chase looked like a madhouse. Even though it would’ve been cool to snag a gold ball, it it would be worthless because you wouldn’t sell it. hey zack. congrats on the cano ball. I was watching it and i was like, no way he just caught that. 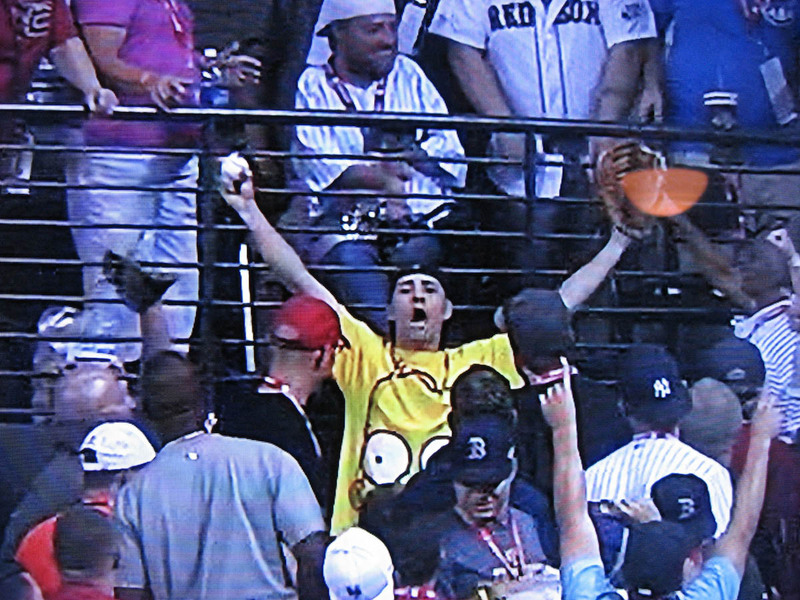 then I saw your homer shirt and i was like, he DID catch that ball! anyway i saw you 2 more times after that with some homeruns that came really close to you. which ball in the picture is the cano ball? also, cant wait for the all star game entry. hope you got an all star ball. see you on september 21st at busch stadium (hopefully). any way see you later! keep on snaggging! Nice meeting you out there, Zack. Awesome Haul! Great job man. 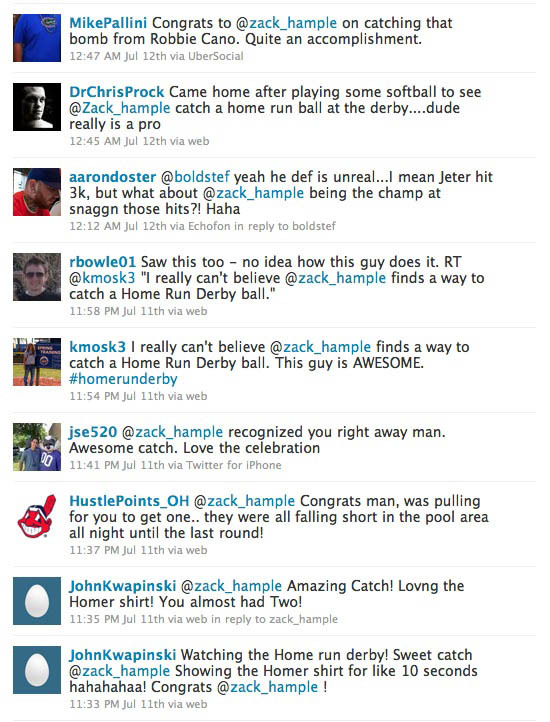 If you didn’t get a ball at the HR Derby would you still count it as a “game”? 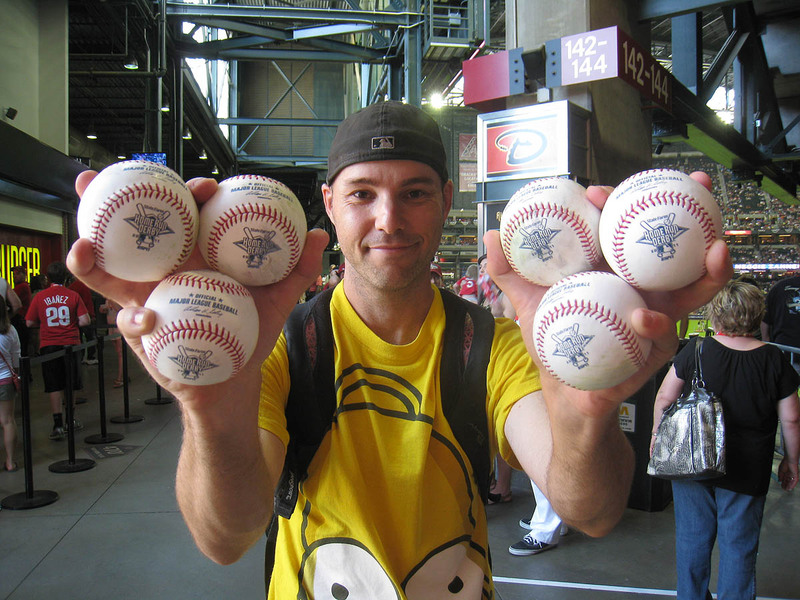 Man, I wish I could have attended the HRD and tried for one of those commemorative baseballs myself. I did get a pair of commemorative ones during the Futures Games BP, though! I’ll have to keep my eyes open for HRD and ASG ones at garage sales and such that I can try to get….. Great job on catching the Cano homer! 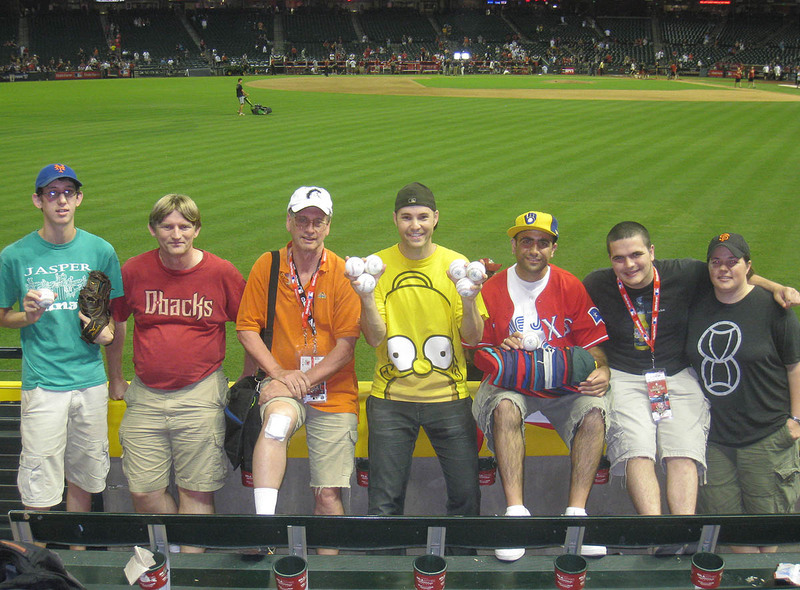 I watched you on TV and remarked to my brother that I knew who you were with that Homer shirt! al. Sooooooo cool! Quick Q, couldn’t the Robbie Cano homer count as a game ball because you caught it during the “game”? 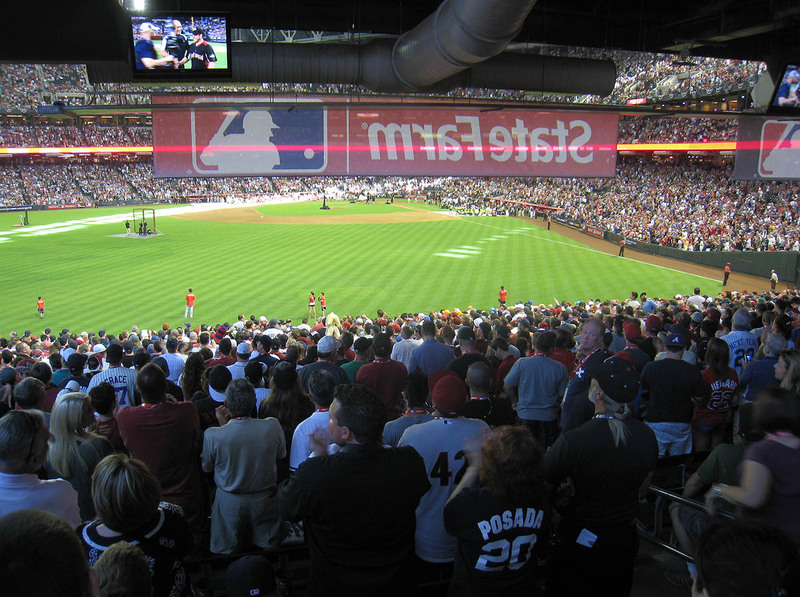 One lanst thing, did you see that “Sounds of the game” segment that Fox did with Heath Bell? 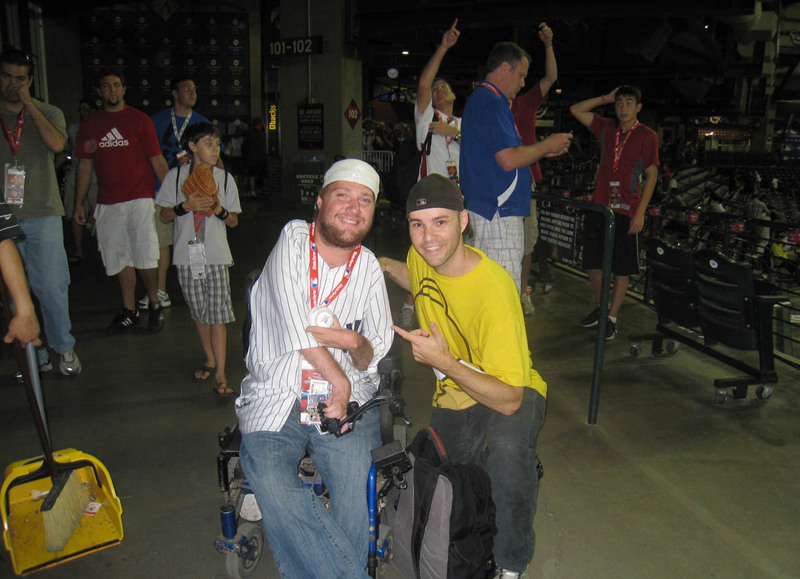 If not, it proved your point even more that Heath Bell is the awesomest player in MLB. Same thing with his sprint and slide on the way in from the bullpen. My new favorite player? Heath Bell. MLBogs is screwed up right now and if you actually want to see my blog, this is it: http://nickbadderstheteenbaseballexpert.mlblogs.com/ and yo can follw me on twitter at @nickbatters. Just sayin. Let me take this opportunity to thank you for sharing that information about my love for Mandy Moore lol. I loved reading this entry! It felt like I was there, love the way you write… I’m happy for you that you got the chance to meet your childhood hero, hope one day I’ll meet mine. PS: your swings didn’t look that bad! 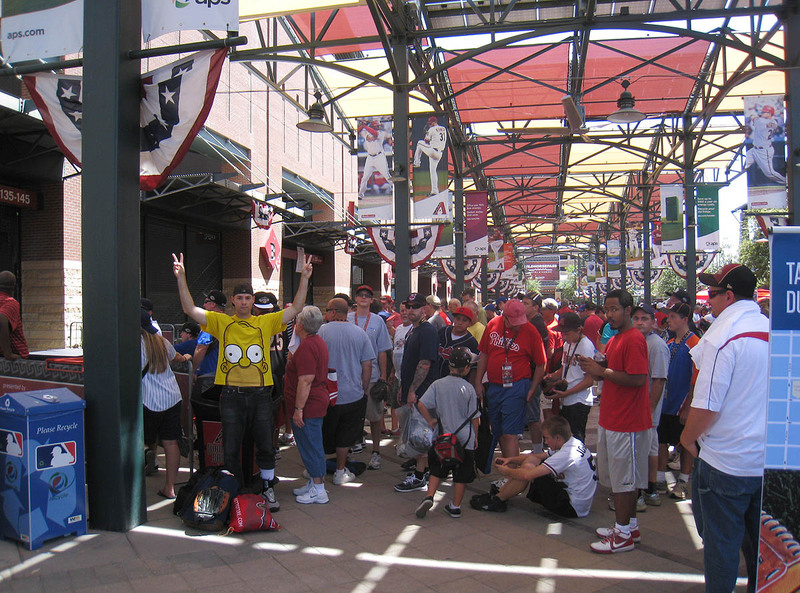 Well, this answers my main question from the homerun derby: why isn’t Zack running back and forth in the CF concourse? That looked like the ideal spot. I like those commemorative baseballs…except for the State Farm and ESPN logos. 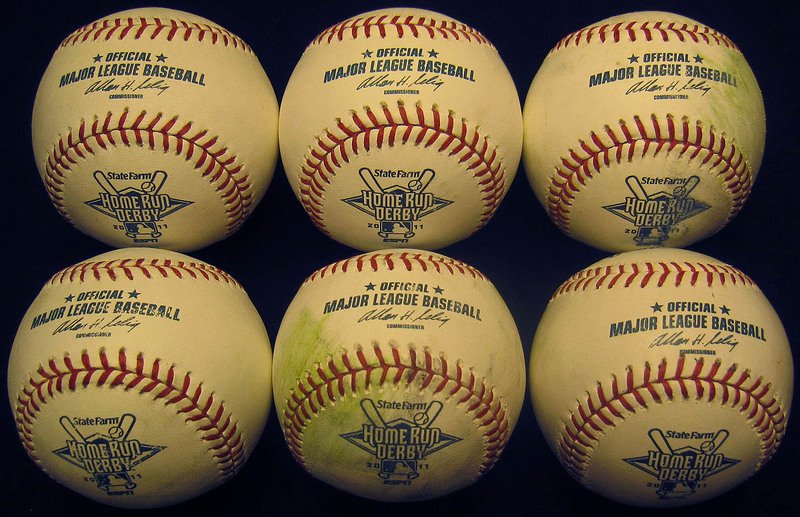 Ads on baseballs = lame. 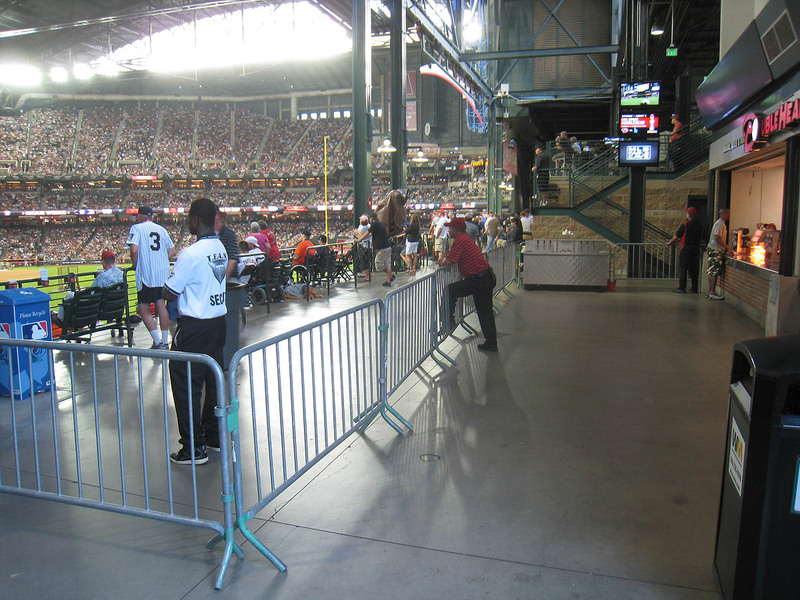 Its a slipperly slope that I hope stops with the homerun derby and futures game balls. 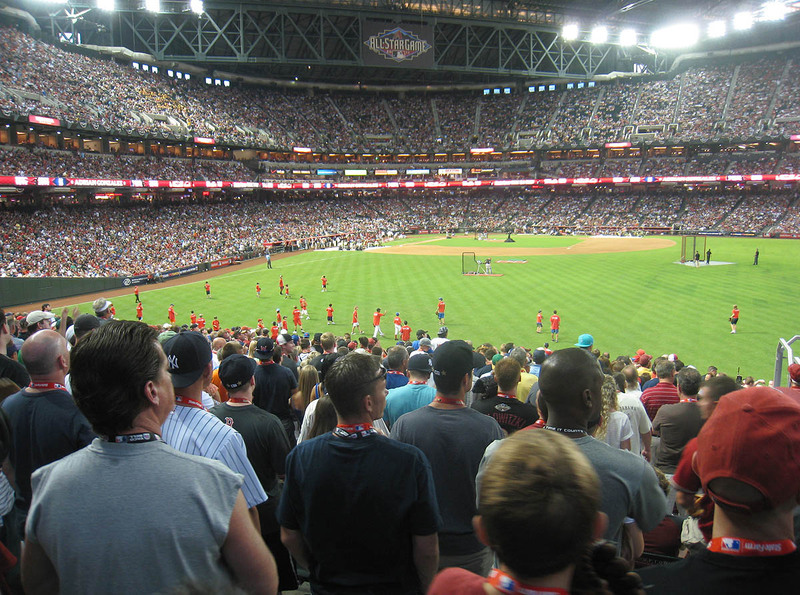 Zack – I don’t know if you saw my tweet, but I was in the RF bleachers for the derby. I saw you catch that ball and just started laughing, what you do is insane man. I got *so* close to Adrian Gonzalez’s 5th homer in the first round -it was caught literally inches from my glove! So close, yet so far away I guess. 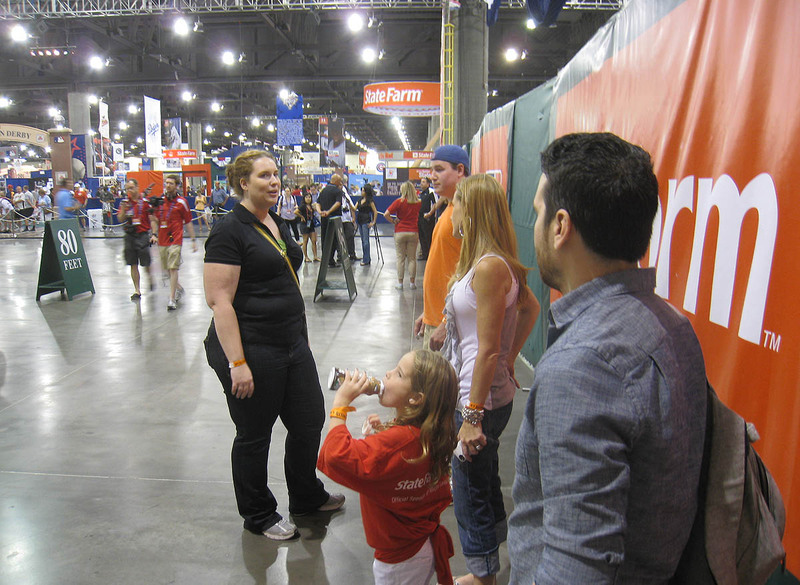 Just for reference, you talked with me on your way to fanfest Sunday afternoon, thanks again for taking some time. Congrats on your haul here and hope to run into you later in the year! how did u not get ripkens autograph!! Ayyyy my twitter’s in this! A picture of Mandy Moore above his bed? Are you kidding? I am not one to judge anyone because I have my issues believe me! But, if you were single and tried to bring a girl home, I am guessing that a poster of some broad above your bed might be a dealbreaker. Just how many jerseys does your friend have? Great blog per usual. I am getting excited already for going to my first all star game next year in KC. It was a classy move to give that guy a ball. Looking forward to your next blog. Once again you have outdone yourself. It’s cool that you got to attend the home Run derby, AND catch the Cano ball. it was a nice bit of work. BTW, it was nice of you to break your rules with that guy. Big Glove Bob – You’d be surprised at the fact that the poster helps more than you’d think possible LOL! Again, I did not in any way ASK for Zack to add that to this entry haha. But hey, I’m told you’re in Minnesota, correct? I’ll be there Tuesday, Wednesday, and Thursday of this upcoming week. Are you going to any of those games? I’d love to meet. Also, I’d like to say what’s up to Dave and Kyle, both of whom I met in San Diego at last night’s 12-inning Giants vs. Padres game. Thanks guys for coming up to me and saying hello. I’d hope anyone that recognizes me from this blog will continue to do that. I’ll be in Arizona today and Saturday, Colorado on Sunday and Monday, then Minnesota on Tuesday, Wednesday and Thursday. Hey Zack…check this out. The fan that caught Jetet’s 3000 hit ball is getting his own auto’d ball marketed through Steiner Sports in NYC. Other than his Mom and Dad i’m not sure who would pay $34.99 for it..:but good for him. Congrats on your home run derby snaggings. I’m still planning on going to the mets game on Saturday but doubt you’ll be there cause you were just on the west coast. Ben- I will not be there those dates, but I will be curious to hear what you think of the stadium. Enjoy your time here! Hi everyone. This is Dave in San Diego. 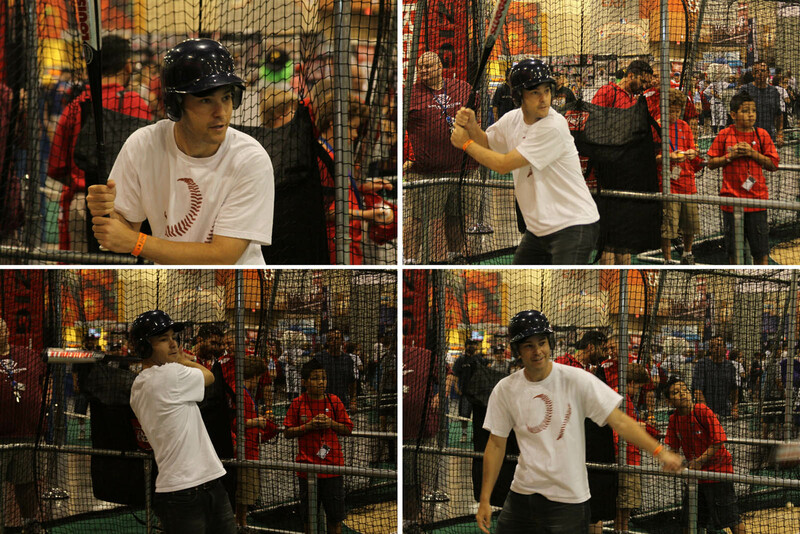 First, Zach, totally impressive job with the HR Derby. My daughter and I were watching, and just laughed when you snagged the Cano bomb. Sophia said, “of course HE’D do it!”. Can’t wait to read about the actual game. Lastly, shout out to Ben. It was great meeting you and hanging out a bit. To those of you who never get to meet these guys, I wasn’t sure what they’d be like. Ben, I was totally impressed — not only are you a cool, down-to-earth guy who knows his baseball, but I was totally impressed how you could have snagged a lot of balls but let kids have them instead. That was ultra generous. I would love for you to start a blog so we could learn about your travels/ball hawking/jerseys/hats/Mandy Moore. Which, by the way Ms. Moore is on my top ten list, so I can’t blame you one bit. I’m the most amateur ball hawk out there, but glad I could bring home six on a crowded night with an ULTRA stingy Giants team. Hey Dave- Thanks! I really appreciate your kind words. I’m glad I had the pleasure of meeting you as well. You and your daughter were really cool, and I just love how into it she was. It seems like you guys have a really great time. Most kids can’t sit through 6 innings, let alone 12, and she definitely seemed to be into it all the way through. And I’m not out there to take balls from kids. I hope none of us are. I’ll take what’s given to me. I’m not gonna fight and scratch for a baseball, cause that’s just not fun. I hope to see you again sometime soon, or somewhere else. So Zack… How do you feel about the Mets signing Gustavo Chacin? 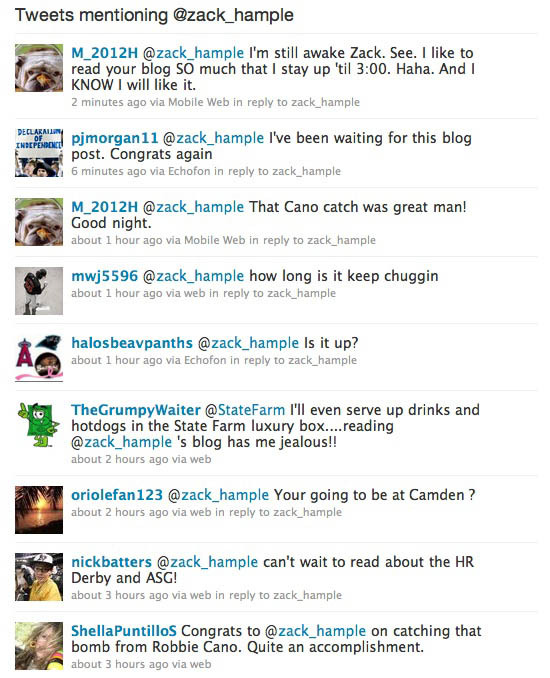 Do you think the Hample curse is going to backfire? I went to the Yankees/Blue Jays game today and the video you posted back in May of yourself catching balls at Rogers Centre was really helpful. 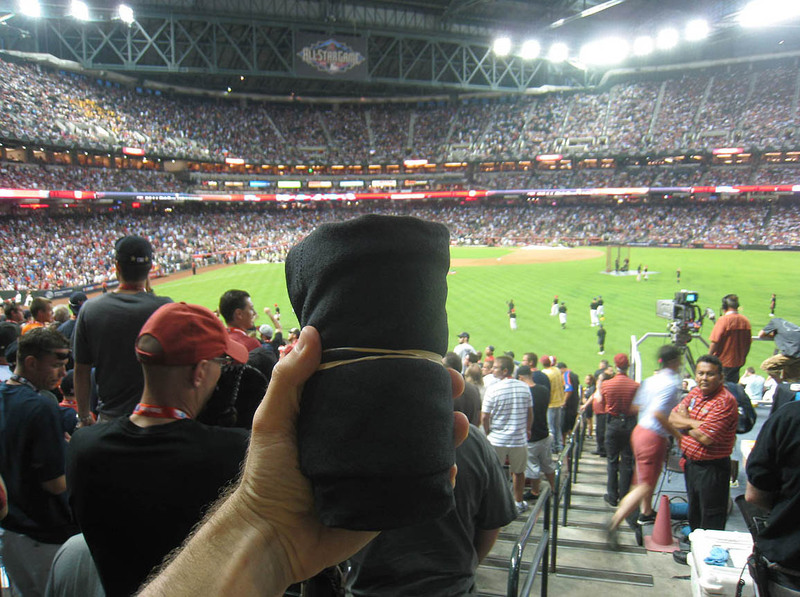 I was roughly where you were in the video (your 5000th snag video), right on the edge of the bullpen and a ball bounced on the field and right into my glove for my first Major League Ball! It was my only catch of the day, however, but where I was at was definitely the best position. Also, Jon Rauch (the 6’10 monster with neck tattoos) gave a ball to someone and didn’t tell them not to ask for another one. I guess he was in a good mood today. I went to the the mets gAme today and my hopes of snagging a ball went down when I found out there was no bp. But thanks to my roster sheet and change of red clothes (phillies) , I got Michael stutes to toss me my only ball of the day. out of every t-shirt you have ever caught which one my be your favorite?i have 5 mets tshirt launch shirts and my favorites are probably 2008 and 2011. my year range is from 2006-2008, 2010-2011 but i just wanted your opinion on your favorite? Hey Zack – Did you consider cutting open one of the Derby balls to see if Cal’s suspicion is right about it having a superball in the middle? Nice thing you did giving that guy a ball!